What is an Upper Lift Rail? Not all aluminum windows are the same. When you open or close your operating window, you may have to fight your way through curtains or other window treatments just to get to your window. Once you’re there, you might have to bend over a table or even move furniture in order to get access down to the bottom of your window’s sash in order to open it. Not so with our Series 8200 Single Hung aluminum thermal-break windows. Our stout lock rail features an extended integral rounded lip that serves as a very convenient handle to make lifting and lowering our sashes a breeze – from the middle of the window at the top of the sash. 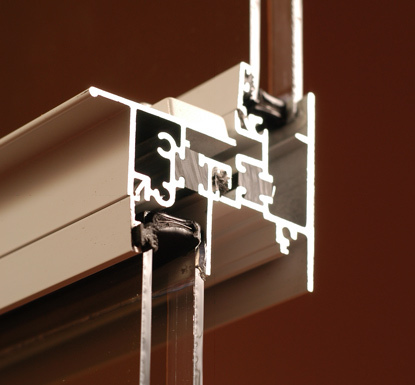 Just open our cast zinc locks, grip our solid lift rail, and open your window! This picture also shows our massive wall thicknesses, our high-density polyurethane thermal breaks, our unique metal interior glazing beads with their rubber gasket, and the wide, ¾” glazing pocket for double-pane insulating glass.